‘This is very different from the unfeeling and emotionally distant historical coverage of a war. I felt a weight in my lower chest as I learned about the stories and suffering of the people, witnessed their rage and despair sculpted on their faces, and felt the ground tremble under my feet. I was immersed by this, and now feel much more sympathy towards these people.’ – visitor’s handwritten message on a poppy. One of the most arresting sights in Gallipoli: The scale of our war is the final giant sculpture of Cecil Malthus in his muddied great coat. His huge, hunched back confronts visitors leaving the stories of evacuation from Gallipoli. He is fully laden with his soldier’s kit. His eyes gaze into the darkness of the next three years on the Western Front. 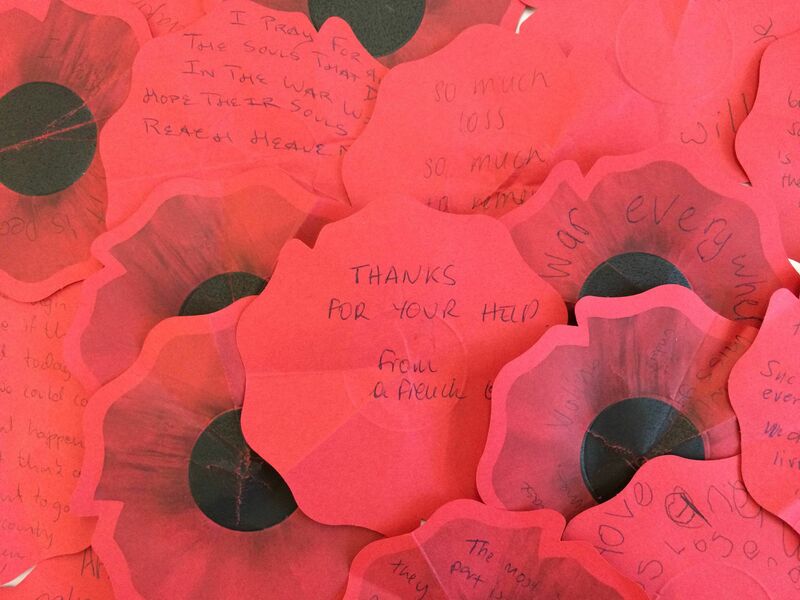 The shell-pit he trudges through is now filling with red paper poppies left by visitors. Lucy and I were part of the team who created the exhibition. When it opened in April 2015 to queues of people prepared to wait hours to enter the experience it became clear that these stories were now in the hands of others. 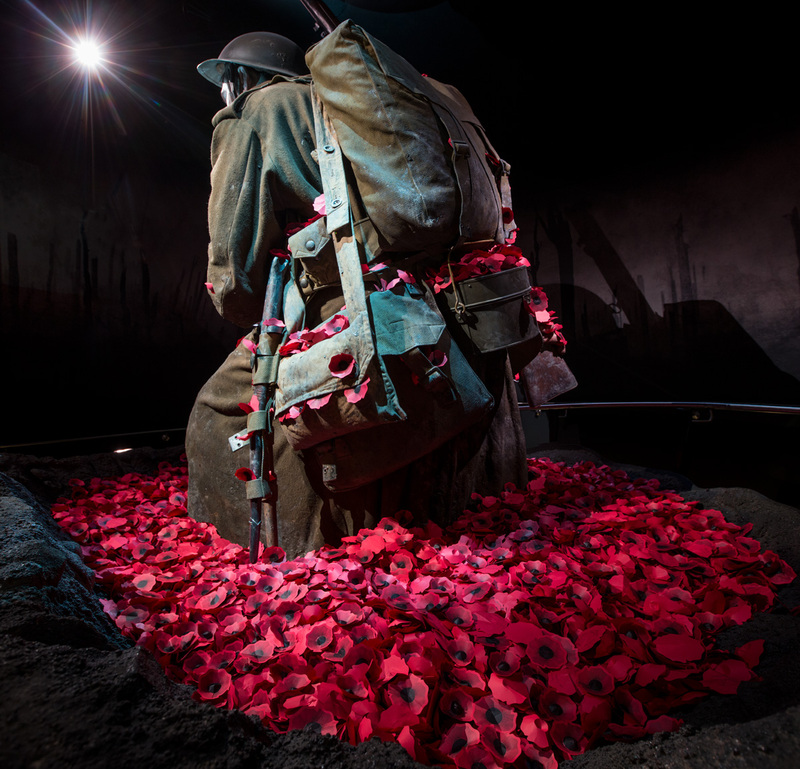 So far, 8 weeks since opening, 100,000 poppies have been left by visitors to the exhibition. The poppies left with Malthus are poignant evidence of people’s impressions of the stories told in the exhibition, and the memories and emotions they arouse. 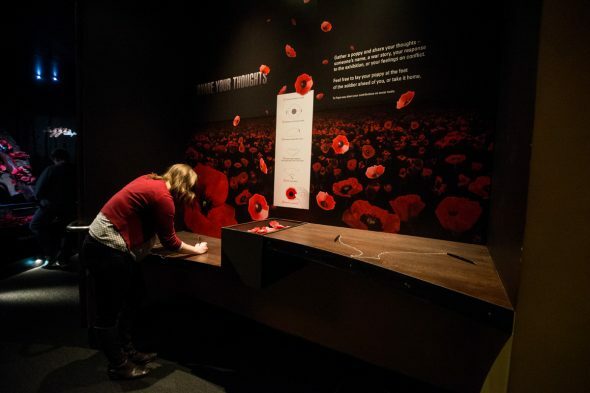 It’s a reminder too that as exhibition creators we are only one part of a much larger process – people connecting with events of 100 years ago. ‘Thanks for your help – from a French girl’. In the months ahead we’ll share more messages left by visitors to Gallipoli: The scale of our war. The poppies available to visitors in the exhibition are generously supplied by Ricoh. I would also like to ask for a template for school. We have an Anzac assembly every year and make poppies for everyone in attendance. Is there a template for the poppies available? We would love to use this in school.